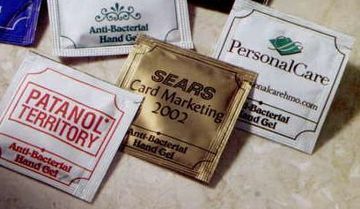 Custom Sanitizer Gel Packets Personalized in Bulk. Promotional, Cheapest in USA, Canada. Personalized Gel Packets Custom Printed in Bulk. Promotional, Inexpensive. Lowest prices in USA and Canada. Bulk antibacterial sanitizer gel packets with fast production. These are a perfect small, ‘go anywhere’ item. Can be used anywhere, any time. Healthful, Convenient, super Cleansing Anti Bacterial Hand Gel. Free artwork design. Budget Prices in the USA and Canada for bulk sanitizer gel packets . American clients pay no taxes . Free artwork design. We also supply blank (not custom imprinted) wholesale hand sanitizer packets for $0.26 each (minimum 500). Unit prices below include your custom imprint in up to 3 colors. There is also a Setup Charge of $50.00 per color. You may order any quantity above the minimum. Setup charge $75.00 per color, up to 3 colors; $20.00 per color on repeat orders. Production Time: 5-7 Working Days. Rush production is available: contact us. We also supply blank (not custom imprinted) wholesale hand sanitizer packets for $0.26 each (minimum 500). Please multiply the US prices by 1.30 to find the CDN$ prices. Made in the USA, FDA approved. Color: Metallic Gold, Metallic Silver or White wrappers: same price. Please specify. Alcohol Content: 62%: it kills 99.9% of all germs on contact! Max Imprint Area: 1 1/2"x1 1/2".The border shown in the photo will be imprinted upon request: it reduces the imprint area to 1 3/8"x1 3/8". The imprint is done directly on the packet (not on a label). Production Time: 10 Business Days after art approval. Rush 3-day production is available: add 15% to unit costs. Call us to place an order or fill up the Order Form below. Our artwork design is free and we will Email you a proof for your approval before production. Please Email your imprint to info@mapleleafpromotions.com We will add the most economical shipping charge by UPS Ground unless you instruct us differently. Thank you!